Ryc Aquino, Jon Sutton and Ella Rhodes report from the Psychology Postgraduate Affairs Group Annual Conference. The 31st annual Psychology Postgraduate Affairs Group (PsyPAG) conference was held at York University this year, bringing together talks from both seasoned academics and postgraduate psychology students. Health Psychology PhD student (City University London) and PsyPAG Vice Chair Ryc Aquino, The Psychologist Editor Dr Jon Sutton and Journalist Ella Rhodes were there to report on the three-day event. This year’s conference kicked off with PsyPAG Chair Emma Norris welcoming the 150 delegates, followed by an inspiring talk by Professor Quentin Summerfield (Head of Psychology, University of York). He emphasised the importance of embracing research impact, as well as the diversity that the field offers – we should all, he said, strive to strengthen this. Professor Alan Baddeley (University of York) gave the first keynote, entitled Confessions of a Door Bore, which explored not only his love of doors, but also his extensive research on human memory inspired by this. The morning parallel sessions followed, covering a range of areas: relationships; health, social, and cognitive psychology. Dr Harriet Over (also University of York) presented a keynote on social motivation in young children on the first afternoon, which demonstrated that when children were shown videos depicting ostracism, they then went on to draw themselves closer to their friends as compared to when they watched videos that did not depict ostracism. Parallel sessions included presentations on risk-taking, and in a series of workshops and symposia to close the day Emma Norris and Tommy Van Steen led a systematic review workshop. Dr David Ellis led ‘The Dynamic Researcher’, imparting advice on securing one’s first academic post. On the second day Professor Daryl O’Connor (University of Leeds), who takes on a fairly punishing conference schedule himself, began his keynote with the Japanese concepts of karoshi (‘death from overwork) and karojisatsu (suicide from overwork). Closer to home, the figures are alarming: there were a quarter of a million new UK cases of work-related stress in 2015, and 23.2 million working days lost due to work-related ill-health or workplace injury. Work-related stress, depression and anxiety accounted for over 9 million of these. This is not a new problem, but there is increasing evidence to indicate that stress affects health both directly through autonomic and neuroendocrine responses and indirectly through health-related behaviours. Diet is a major factor in cardiovascular disease risk, and so health psychologist O’Connor has been looking into the effect of daily hassles and eating style on eating behaviour. The traditional view is that stress will inhibit appetite and food intake, but the picture is actually more nuanced – we seem to consume less main meals, less veg, more high fat snacks, and more high sugar snacks, on days when stressors are encountered. O’Connor highlighted a possible glucocorticoid mechanism behind this: those who release more cortisol in response to stress increase their high fat snack intake even more when they encounter daily stressors. With colleagues, he developed a low-cost, easy to deliver intervention based on Gollwitzer’s idea of ‘implementation intentions’, and ‘if-then plans’. Participants chose a healthy snack alternative, linked it with a stressful situation, and visualised themselves acting out the plans. Unlike the control group, they then did not significantly increase unhealthy snack intake on days when stressors occurred. Also on the second day of the conference, we heard from Charlotte Wesson (University of Lincoln) about her research with users of dating app Tinder. Males who were higher on a measure of ‘sexual risk’ were faster at swiping right (to accept a potential match); the opposite was seen for women. People who were higher risk did meet up with more people on Tinder. Rebecca McCartan (University of Strathclyde) used the Implicit Association Test with drivers, to find that the ‘positive dimension’ of explicit attitudes is important in dictating speeding behaviour. Behaviour change interventions should target these, for example questioning whether speeding really does get you to your destination quicker. And Alice Sanderson (Aberystwyth University) had an interesting take on multimodal aspects of teaching and learning, recording 11 sessions of musical theatre rehearsals over a five-week period. Students shifted between talking and non-verbal gestures, with gestures often used to complete questions (e.g. Do you want the note [point higher]). We are living in the golden age of face-perception research, said Professor Andy Young (University of York) in his keynote address on the closing day of the PsyPAG conference. He spoke about the data-driven approach he takes to his research on the neuropsychology of human face perception. While he would be ‘saying unpleasant things’ about the way psychology research is often carried out, Young admitted he has used many of the methods he was critical of. He said that while the standard scientific method, seen as the gold standard in the field, requires researchers to find a question, formulate a hypothesis and devise a test that isolates the causal factor in that hypothesis, it may not be the best way to add to scientific knowledge. Back in 1973, Newell said that by asking binary questions about phenomena – for example whether something is nature or nurture – the answers become increasingly complicated. Young said: ‘We end up saying “it’s a bit of both” and move on to new phenomena.’ Newell asked whether this approach would actually lead to a cumulative increase in knowledge. Young added that this was often the case in his own field, with researchers asking whether features of face perception are expertise or domain specific, or whether we see features or configurations – all of which remain hotly-debated issues. Perhaps a data-driven approach may reveal more than simply asking an either/or question? Young described some of the methods he and many other researchers have used to reveal more about human face perception – perhaps the richest source of social information we have. Modern technologies allow us to combine features across thousands of faces to create an ‘average’ face, for example. Some of Young’s own work saw him collect 1,000 faces from the internet, ambient faces which were not standardised as they so often are in this type of research. Participants rated these faces on intelligence, attractiveness and trustworthiness and subsequently using computer image manipulation the most trustworthy, intelligent, or attractive-looking faces can be combined to look for shared characteristics. Using this data-driven approach Young concluded there are co-varying, rather than specific, features that make up the perception of a given characteristic. He said these approaches help researchers move away from asking questions they have come up with and can use the features or characteristics participants spontaneously come up with on viewing a certain face. After a brilliant selection of sessions on health psychology and wellbeing and several workshops on statistical techniques, two of PsyPAG’s award-winning researchers spoke about their work and career journeys so far. Lauren Bussey (Northumbria University) won the Masters Award and talked through her thesis study on the effects of rosemary and lavender essential oils on memory in older adults. Bussey explored ‘prospective memory’: this can be time-based, such as remembering to do something at a certain time in the future, or event-based, such as remembering to withdraw money when walking past a bank. She tested 150 older participants, either in a room with no aroma, lavender or rosemary, on their prospective memory and asked them about their calmness, alertness and contentedness. To mask the true nature of the study, participants were asked to drink a cup of ordinary juice before the tasks, being told that the herb may or may not be contained within it. Lavender, long known for its relaxing properties, impaired time-based prospective memory;e rosemary, which appeared to increase alertness, enhanced both time- and event-based prospective memory. Bussey suggested in the future it would be interesting to study these effects in those with no sense of smell. - Picture credit: Your Story Photography. 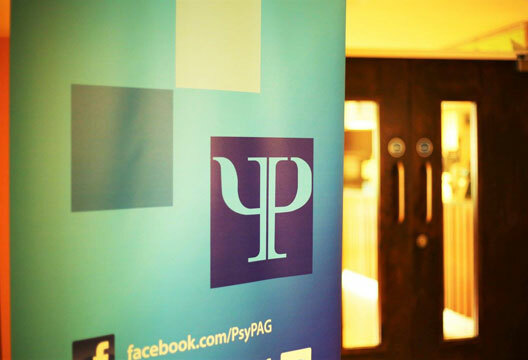 Find out more about PsyPAG.